10 | February | 2011 | SHANNARO!!! 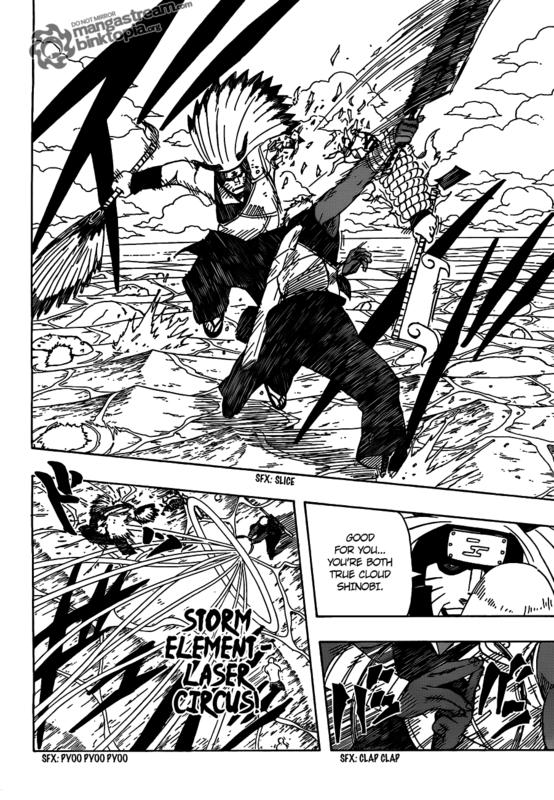 So just read chapter 527, it’s definitely an interesting battle that’s going on and we even get a few important name drops like 2nd Hokage and the Sage of Sixth Paths. With still so little to go on about these mysterious figures of the past, we’ll appreciate every morsel of information Kishi decides to shed for us. Yet although the Kinkaku/Ginkaku battle was filled with fast-paced action, I still felt the pace of the story has slowed down a bit. 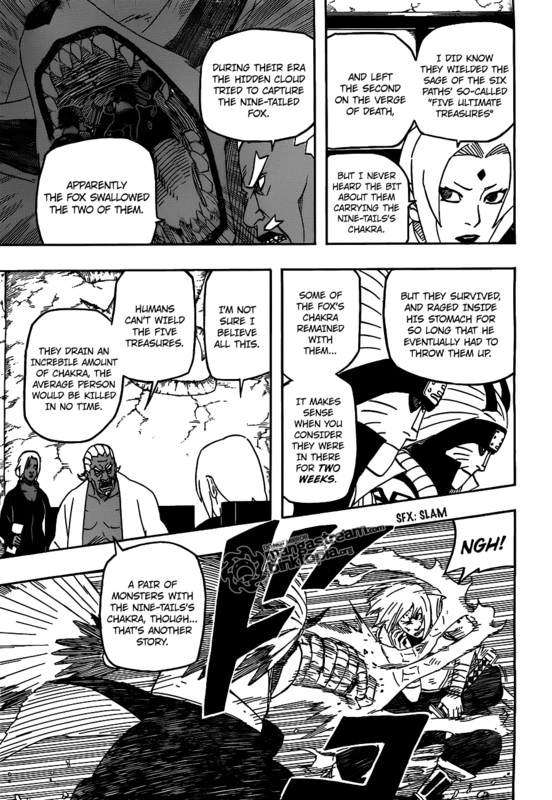 This is partly because this is the first time in a while where Kishi has introduced “new” enemies with elaborate techniques/abilities that require somewhat lengthy explanations. Yes, this tends to slow down the flow of things, but I appreciate how Kishi is once again incorporating mythology and literature into his work. Last chapter I said I wasn’t too interested in the Gin/Kin brothers overall… and I’m still not, lol. To me they just seemed like all the other “elite” but nevertheless throwaway villains that Kabuto has summoned for this war. They were created solely for the purposes of this war and thus disposable. Unlike villains of the past which had enough chapters and time devoted to backstory to help develop them, you know that these new villains have the life expectancy of an anime filler character. They follow the traditional cookie-cutter formula of being introduced with over-powered techniques and have apparently well known and fearful reputations (yet never mentioned before in the series), but in the end are soundly defeated by the heroes and are never heard of again. It’s difficult to get attached to these ‘flavor of the week’ villains. That said, you can’t deny the Gin/Kin brothers have been given some pretty epic powers. The backstory the Raikage gives even states that they left the Second Hokage on the verge of death in their battles – now that deserves some respect. As if that wasn’t badass enough, the brothers also took on the Kyuubi and survived in the beast’s stomach for two weeks, WEEKS! Something like that would probably have drove any other ninja insane, but the brothers came out tainted with the Kyuubi’s chakra, making them even stronger than before. 1. The brothers possess only 4 of 5 weapons. How did the two brothers come into possession so many valuable artifacts? Who has the fifth weapon? And why do I get the feeling it’s going to be important. 2. The weapons are perfect for a Jinchuurikis as they have enough chakra to counter the side effects; I wouldn’t mind if Naruto got his hands on one after the brothers are defeated. 3. Despite how supposedly powerful they are, three of the weapons (the sword, rope and gourd) are kind of awkward in function because they’re not much use unless comboed together. Plus, the function of the gourd is pointless if an affected ninja simply had the discipline to keep his/her yap shut. Lastly, I just found it hilarious that the Gin/Kin brothers’ unique technique is essentially a slap in the face to all character in the series who have annoying, over-used catch-phrases and are natural loudmouths…. Hmmm, can you think of someone who matches that description? Ch 527 is out!!! KinGin bros Fox Chakra explained. Here’s the latest Naruto Chapter. Pretty decent chapter. Makes me question what my ‘Secret Word’ would be. What would yours be? lol.